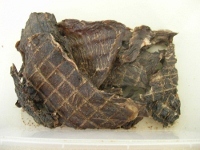 Hand-sliced and dried beef, popular treat with all sizes including some cats. Totally natural product free from preservatives, artificial colours and flavours. Hand-sliced and dried kangaroo. Even the fussiest of eaters love this treat. Totally natural product free from preservatives, artificial colour and flavours. Hand-sliced and dried human-grade liver. This is a nice thin liver and suitable for all size dogs plus cats. Great for training. Totally natural product free from preservatives, artificial colour and flavours. This is a chunky liver and suitable for all size dogs. It is thicker so most dogs will have to chew it – and hopefully taste it as well! Another useful treat for the treatment of arthritis in dogs, naturally occuring chondroitin which acts as a anti-inflammatory. Dried natural lamb lung, a little chewy. Dried natural beef lung, these are a harder treat than the Lamb Puffs and take a little more effort – for most dogs anyway! These are a mix of kangaroo and liver dried into small discs. A nice cruncy treat. A hard tendon taken from the tail of the kangaroo, the closest thing to ‘nature’s toothbrush’! Todd's Tasty Treats is proudly powered by WordPress and BuddyPress. Just another WordPress Theme by Themekraft.